Sam DuBose murder: Phillip Kidd and David Lindenschmidt suspended after backing up fellow officer Ray Tensing's account of shooting. 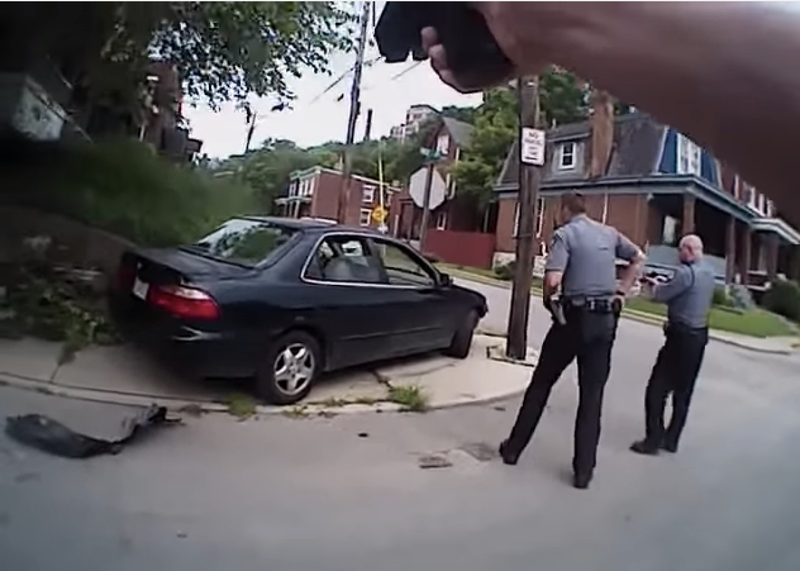 David Lindenschmidt’s body camera shows how a false narrative of Sam DuBose’s killing was constructed. Screen capture from University of Cincinnati police. Two police officers who supported the apparently false narrative given by officer Ray Tensing to justify his fatal shooting of unarmed black motorist Sam DuBose have been placed on paid administrative leave, as two new videos that seem to further damage all three officers’ original accounts were made public on Thursday. Tensing was charged with murdering DuBose on Wednesday and city officials released video footage from his body camera that seemed to contradict the officer’s account that he shot DuBose in self-defense after being dragged by the driver’s car. This account—which appeared to be contradicted by the video from Tensing’s body camera that showed him firing his gun and then falling down—was very similar to the stories initially given by two of Tensing’s fellow University of Cincinnati officers on the scene, Phillip Kidd and David Lindenschmidt, who have both now been placed on leave. Furthermore, the body cameras of Kidd and Lindenschmidt—made public on Thursday—show just how quickly Tensing and his colleagues coalesced around a false narrative of how the incident occurred. The footage should serve as a powerful lesson to anyone who automatically believes the accounts of police officers in these types of shooting incidents, for which cops are rarely prosecuted. Tensing then says “I almost got ran over” and Kidd responds “don’t—don’t say anything,” before cursing again. But Lindenschmidt’s body cam video, which also starts off with him chasing DuBose’s out-of-control car, shows him supporting what appears to be a false narrative of the shooting as well. At just after the seven-minute mark, Lindenschmidt actually describes the shooting accurately, though, saying that Tensing fired before the car went dangerously out of control. (In the video, the car appears to go out of control only after DuBose had been shot when he had apparently attempted to start to pull the car away from Tensing.) “I was right behind him. He fired from right here and the guy took off,” Lindenschmidt says to another officer, getting the order of events correct. At the end of the video, Lindenschmidt says “I’m going to turn my camera off” before being instructed to “keep it on for now.” That’s when the footage ends. The Enquirer also reported that Kidd and Eric Weibel, the officer who wrote the initial report on the incident, had been named as defendants in a 2010 wrongful death lawsuit by the family of an unarmed mentally ill man who died a few days after being restrained and tasered by police. Weibel included what can at the very least be described as his own embellished description of how Tensing looked like his clothes “had been dragged over a rough surface” after the incident. He has not yet been reported to have been placed on administrative leave. The Enquirer also reported that Kidd could be charged for giving a false statement. Update, July 31, 2015, 5:00 p.m.: The Guardian is reporting that Kidd and Lindenschmidt will not be prosecuted for having initially corroborated Tensing’s version of the shooting. “These officers have been truthful and honest about what happened and no charges are warranted,” said Deters. If the two officers did cooperate with the grand jury honestly, as Deters has implied, and will even possibly testify against their fellow officer at trial, then that could be a justifiable reason not to charge them with a crime. It doesn’t change how disturbing their initial behavior was, though, and shouldn’t prevent their police departments from sending down even harsher punishments than have already been applied.